In February 2016, after a long battle for a diagnosis, the Cornell family finally got their answer. Their two-year-old daughter, Cora had Metachromatic Leukodystrophy (MLD), a rare and normally fatal disease. The only established treatment for MLD is a stem cell transplant and clinical trials that will help improve the results of those transplants. As their only viable option, the Cornells enrolled Cora in a phase 1 clinical trial at Duke University. Shortly after Cora woke up from a pre-transplant surgery, which included the placement of her central line and an appendectomy as well as other procedures, one of Duke’s Child Life Specialists gave Cora a Chemo Duck. Confused and in pain, she grabbed Chemo Duck, snuggling him tightly. It was in that moment that Cora and Chemo Duck became friends for life. Cora spent the whole next day happily playing the doctor to Chemo Duck’s patient. She pretended to remove his appendix with scissors and place his chest tube. 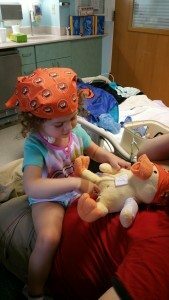 Since then, Cora’s Chemo Duck doctor play has consistently been the best way she has to make sense of what’s happening to her and to exert some small measure of control over her life.